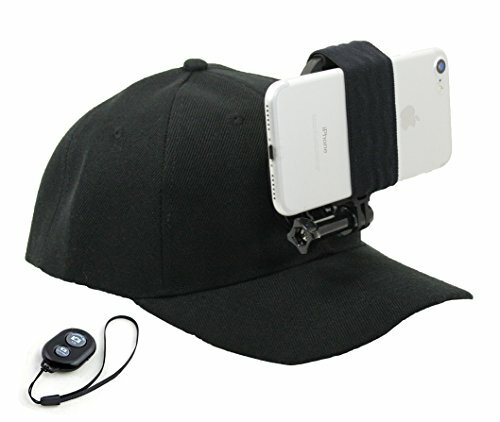 OCTO MOUNT - Baseball Hat Compatible with Smartphone/Cellphone/GoPro Camera Head Mount with Remote iOS/Android Bluetooth Shutter. Any Phone or GoPro Camera Fits, Regardless of Case. This baseball hat with a mount for both smartphones and GoPro style cameras is designed to let you enjoy your activity without having to stare at a camera. New stronger adhesive ensures your device stays secure. This hat can be used while you play golf, hike, bike, ski, snowboard, skate, dance, travel, climb, party, run, rave, skate, date (well that one is a little creepy) - but you get the idea. Compatible with any smartphone (iPhone, Samsung Galaxy, iPhone Plus, HTC, Android) or GoPro style camera. What is in the box - Hat, iOS/Android Bluetooth Remote Shutter, Action Mount smartphone adapter, 2 J hooks, and thumbscrew. Remote shutter is compatible with iPhones and all phones using the Android operating system. Please contact us with any issues and we will make it right. NOW EVEN STRONGER: New design with stronger adhesive ensures your device stays secure. SUITABLE FOR ALL OUTDOOR ACTIVITIES: Perfect for Running, Biking, Golfing, Tennis, Spectating, Hiking, Fishing, Livestreaming, Concerts. ENJOY WITH YOUR OWN EYES: The uninterrupted view allows you to enjoy your activity live instead of through a camera screen. WHAT'S INCLUDED: Hat, iOS/Android Bluetooth Remote Shutter, Action Mount smartphone adapter, 2 J hooks, and thumbscrew. If you have any questions about this product by Octo Mount, contact us by completing and submitting the form below. If you are looking for a specif part number, please include it with your message. Sinjimoru Phone Grip Stand, Secure Handy Phone Strap for iPhone and Android. Phone Holder with Leather Phone Stand. Sinji Grip, Brown.